In the 1980s, toy companies came up with an innovative way to incorporate the home entertainment boom with the classic fun of board games and the burgeoning 'role-playing' games like Dungeons & Dragons. 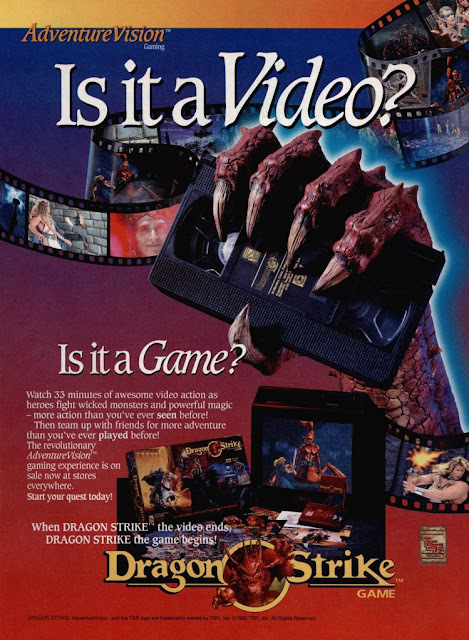 The idea was basically a VHS board game where a set video featuring a scary or fantastical 'guide' played out differently each time on the board based on the players choices and dice roles. It was a fun, niche idea that led to one popular ongoing series with Atmosfear, which released four standalone games and various expansions from 1991 to 2016. 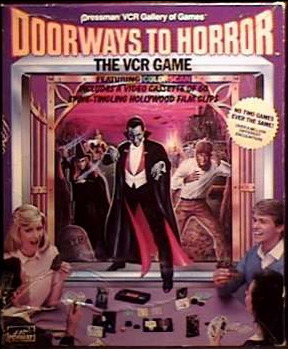 Doorways to Horror was one of the earliest VHS games released and it opted to bring the classic horror movie world to life. In the game, the players move around the board and encounter different monsters like witches, zombies, vampires and werewolves who they need to defeat. Classic horror movie clips accompany the action, which were taken from movies that existed in the public domain (i.e. outside of any rights issues). The object of the game was simply to reach the end of the board having defeated all the monsters, and the game is fondly remembered for its terrible puns and it's charmingly low-budget retro clips. PRICE: Doorways to Horror is currently available online on VHS for £10-16. Doorways to Adventure focused more on the action adventure, along the lines of the Indiana Jones series. The VHS tape in this case offers the players a visual cue of mystical objects they must barter and bribe each other for. As is common for this type of game, the tape also acts as a game clock. The players compete against one another to collect as many artifacts as possible and the player with the highest value treasure at the end of the tape wins. Once again the material on the VHS is low budget but the game was extremely popular at the time. This is mainly due to the innovative nature of the game's design and the exciting regularity at which players would steal each other’s treasure. PRICE: Doorways to Adventure can be found online for around £17 for a secondhand copy. 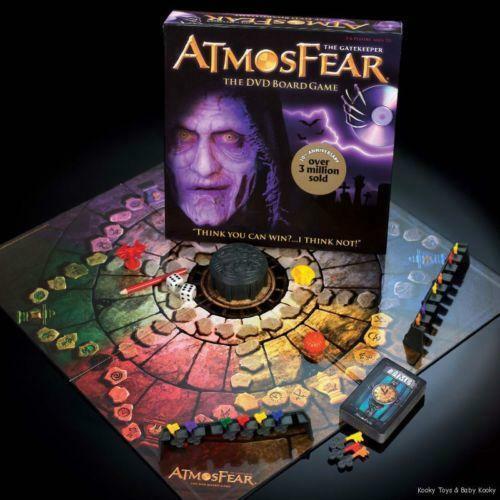 Probably the most well known and one of the most popular games in the VHS board game genre, Atmosfear (known as Nightmare in some regions) sold two million copies in just two years and spawned several sequels and three expansion games. 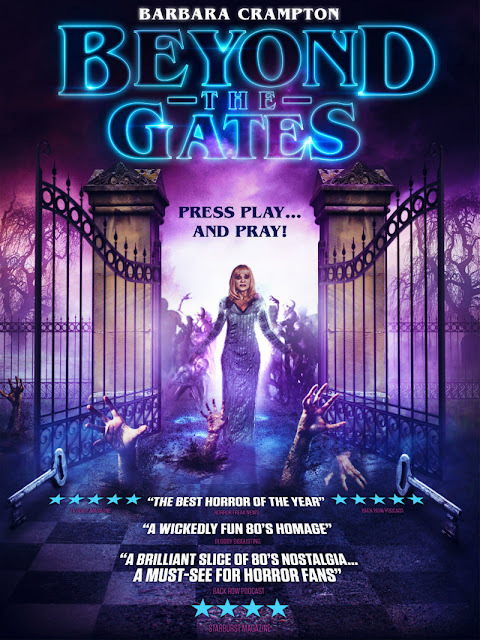 The horror themed game is set in a place called “The Other Side” and each player adopts the persona of one of the set characters, who each rule over a province. 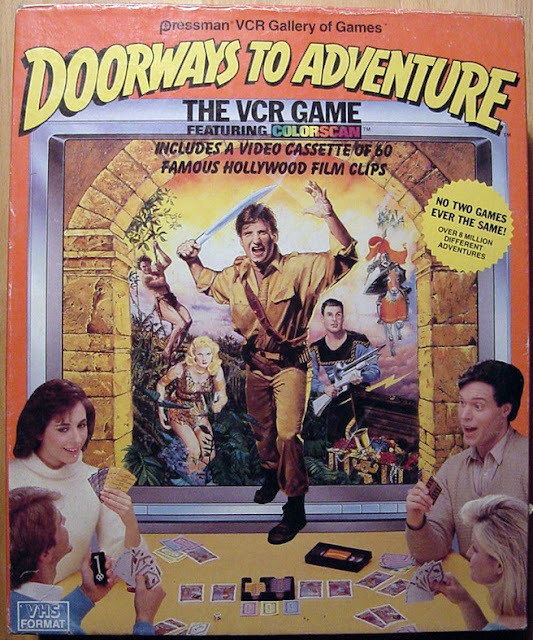 The VHS and game is controlled by an actor who portrays the evil Dungeon Master style 'Gatekeeper', who shouts at the players and controls the hour long battle. The players must collect keys using dice on the board and reach the middle of the game before the time runs out. The well-made VHS has increasingly pulse-pounding music and evolving creepy make-up FX on the Gatekeeper that ramp up to a tense, scary and usually hilarious finale. Atmosfear is also available on DVD, and it's still a fun evening with a few open-minded friends! PRICE: Atmosfear can be found online being sold for between £10-£40 depending on its condition. This adventure themed game was based on the popular role-playing game Dungeons & Dragons. The VHS tape is used to set the scene and once again works as a visual aid to the adventure that the players undertake. The tape made use of both live actors and CG monsters and magical effects. Each player chooses from five roles - dwarf, thief, elf, wizard or warrior - and each role comes with ratings such as speed, strength and hit points. The Dragon Master (a designated player) chooses a mission from the adventure book, and the game begins. Markers and cards challenge the players, which may force them to face monsters or traps as they make their way around the board. The mission must be completed within a set number of turns. The VHS is now highly comical thanks to its over the top acting and poor effects, but it did help introduce novices to role-playing games as their popularity was beginning to dwindle in the '90s. PRICE: Dragonstrike can be found online for approximately £30.